At the ECB interest rate meeting, President Mario Draghi strengthened his commitment to use stimulus to aid the Eurozone's economy. On top of that, policy makers said that they were ready to implement additional measures if needed, sending the euro tumbling below the $1.24 level against the dollar. Ahead of today's ECB policy meeting, the shared currency continued its slump against the dollar, falling below the $1.25 mark. It seems that the risk of deflation is slowly becoming a reality and the outlook in the Eurozone is deteriorating despite efforts by the central bank to pump money into the system. It's widely expected that the ECB will not follow the Bank of Japan's example by expanding monetary stimulus at its interest rate meeting tomorrow. 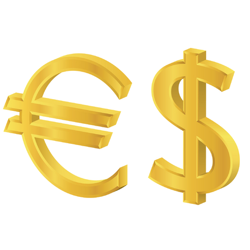 That sent the euro 62 points higher against the US dollar to $1.2546, but with the Eurozone economies still struggling for growth, this might only be buying limited time before the slump continues. The manufacturing sector in the Eurozone largely stagnated during October amid shrinking output in Italy and France. The news did not bode well for the shared currency in the FX space, which continued to slump against the dollar, losing 27 points to $1.2481. Unemployment in the Eurozone held steady at 11.5% in September, whilst Consumer Prices rose by 0.4% from the previous year, confirming the estimates. However, the measures taken by the Bank of Japan earlier in the day had already attracted dollar demand. So the EUR/USD pair slumped steadily throughout the session, closing 89 points lower at $1.2523.